Natural food in a nutritious gel, enriched with vitamins, trace elements, proteins and fats. The snack is also suitable for marine fish. A scientific blend of vitamins and essential nutrients proven to strengthen disease resistance and improve the overall condition of your fish.br> Carefully selected ingredients like seaweed, spirulina maxima algae, highly nutritious fish-oil and marine crustaceans ensure a natural nutrition. 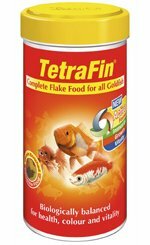 TetraFin was the first flake food to be developed specifically for the nutritional needs of goldfish, and has been continuously updated and improved since. Feed TetraFin flakes to your fish 2-3 times a day, feeding only as much as they can consume within a few minutes. Complete stick food for goldfish. Wholesome staple food for small and large marine fish. r> Optimally balanced raw materials such as, e.g. kelp, spirulina algae, highly nutritious fish oils and small marine crustaceans, ensure a natural diet, appropriate to the species. The floating properties of the flakes suit the fish's eating habits.